That done (we got a Tico card which we later changed to Claro) the next step was to get an Uber into the city. The quote from the official airport taxi was $70k and the Uber $62. We were then told that Uber was not “legal” in Medellin and we had to eventually meet in the parking area. This was not easy to negotiate with our English and the driver’s Spanish. The ride is an interesting 50 odd minutes over the mountain and down into the city. There is a tunnel through the mountain under construction which should be open by about September 2018. Visiting this museum is an emotional experience even though there aren't English translations for some of the exhibits. The feelings and emotions are clearly portrayed and easily felt. Medellin has addressed, and is still addressing, the need to recover from the unspeakable violence of the past and one way of doing this is through this Remembrance Museum. It tells the history of conflict in Colombia, honoring it's victims through photos, videos, and other interactive exhibits. 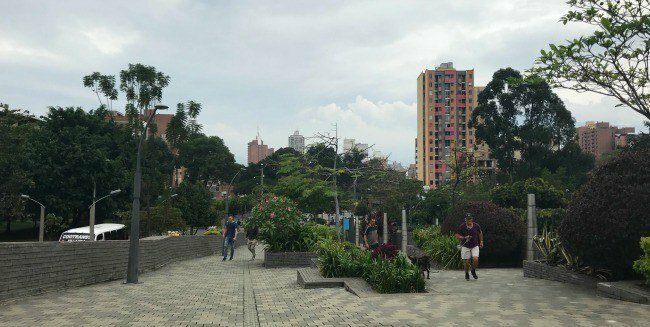 It's artfully done and a really important experience for any tourist to better understand how the modern Medellín came to be. Fernando Botero, Colombia's most famous artist, is originally from Medellin. He donated a large collection of his bronze statues to the city, and they are on display in Plaza Botero, below the Parque Berrio Metro station. We stayed in two AirBnB hostel style places with a shared kitchen and common spaces. They were “same same but different”. The first was in a quiet area and had a group of young people staying there who we just didn't connect with. The second place was close to Carrera 70 – a street filled with restaurants, hotels and at night vibrant, noisy enjoyment loving crowds. The young people here were a pleasure to be around. Being in Medellin for two weeks made us realise again that most of the stuff you read and hear about countries and cities is sensationalism ,,, often driven by “link bait” headlines or a very limited point of view. Medellin is a vibrant city with communities and areas covering the full spectrum of a big city. It is also quite heavily policed. There are more dangerous areas (immediately obvious!) and some areas that are safe during the day but no go areas for tourists at night. We did a lot of walking around on our own and apart from being approached by the odd beggar were never hassled.